A Combine Harvester in GTA San Andreas. The Combine Harvester is, as implied, a combine harvester in Grand Theft Auto: San Andreas. The Combine Harvester is designed as a drivable combine harvester more suited for farm use, being distinguishable by its wide revolving combine head that moves as the Combine Harvester is moving. Its resulting wide width and weight, coupled with a rear wheel drive configuration, makes the Combine Harvester difficult to control, navigate on populated roads, and store in regular garages. The vehicle is only available in maroon. A unique ability of the Combine Harvester is its capability to dismember pedestrians when the player runs him/her over, and then discharge the body parts and blood through an outtake towards the rear. However, the player character himself cannot be dismembered or gored through by a moving Combine Harvester. 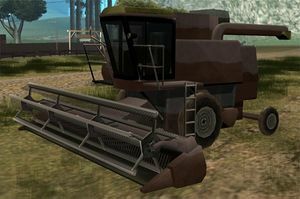 The Combine Harvester makes its first appearance in the mission "Body Harvest" when Carl Johnson is asked to steal one by The Truth while it is operating at a farm. Upon completion, Combine Harvesters will appear all over San Andreas. Due to its use as a farming equipment, the Combine Harvester is exclusively found in farmland, specifically Blueberry Acres, The Farm and Flint Range. At day, the harvesters will be seen operated by a driver and moving along a predetermined route in the fields; at night, the harvesters are parked in the fields. Almost all encountered Combine Harvesters, especially those at night, are locked, making the vehicle very difficult to steal. In order to obtain one, one may shoot a Combine Harvester's driver at the head, killing them and resulting in the driver falling out and leaving the vehicle's door open for the player to steal. During "Body Harvest", the Combine Harvester is scripted to spew out bundles of hay when driven on the farm. The Combine Harvester's engine has the same sound as the Trashmaster's engine. No matter which pedestrian is run over by the Combine Harvester, gibs of a farmer are always spat out at the back. The default radio station in the Combine Harvester is K-Rose. At one point during development, the Combine Harvester had a green body color, no stepbars into the driver cab, and a less detailed combine head. There is an occasional glitch where if you shoot the driver inside the Combine Harvester, the door will be open then lock itself again. This page was last modified on 27 August 2013, at 12:40.